The TLOG is an efficient measurement and indication system for a maximum of 20 temperature channels with USB interface. 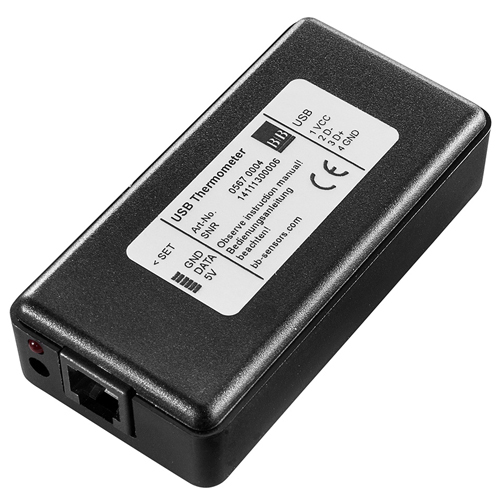 DALLAS®-sensors of the DS1820 type are used as temperature probes and can be distributedly connected up to 60 m. Between PC and sensors a microcontroller module for the USB interface is plugged in. The sensors are identified by their serial number. The in the adapter integrated microcontroller drives the USB bus, manages the serial numbers and captures the temperatures of the connected sensors cyclically. The current measuring values are displayed as ASCII string via the USB interface to the connected PC. The recording of the measured value happens online with the PC. An easy-to-use Windows software for the EXCELTM compatible recording of temperature values is included in scope of delivery. With the optional software PCLOG or Profilab extensive monitoring and controlling functions are possible.